You may think you’ve seen 3D Multi-Beam Sonar in action, but many of those images begin disappearing as you approach 200 feet. Furuno’s DFF3D takes 3D Fish Finding to new depths. We’re talking depths of over 980 feet, with Side Scanning over 650 feet. See fish and bottom structure as you’ve never seen them before, at depths previously unfathomable. Now you can visibly see fish schools and the underwater landscape at great depths in amazing detail. 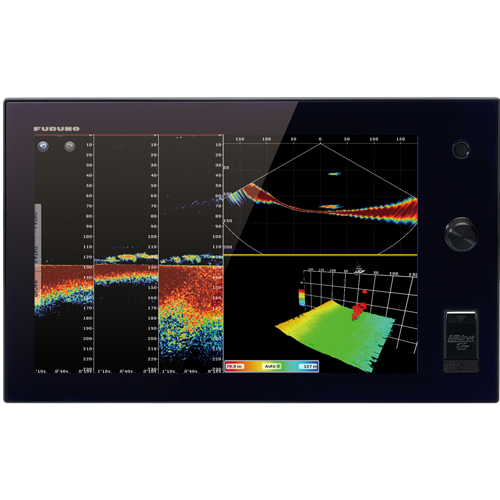 The DFF3D turns your NavNet TZtouch or TZtouch2 MFD into a multi-beam sonar that can see 120-degrees port to starboard, allowing you to see the depth and direction fish schools are moving, while displaying the seabed condition in real time. A single (directly under boat) or triple direction (middle, left and right) fish finder image are displayed simultaneously. The Triple beam display helps to understand the depth of fish targets and the seabed condition in each direction, as well as the direction the target fish are moving. Each beam angle and beam width are selectable. Side scan clearly displays the shape of structure as a high definition image in port and starboard direction. It is suitable for searching the seabed and understanding the sea floor structure. The sidebar detection range is over 650 feet in a 120-degree swath port to starboard, a distance you've never seen before!